This is a beautiful first Bible in an appealing padded format, perfect for tiny hands. From Noah's Ark to the story of Easter, 25 of the Bible's best-loved stories from the Old and New Testaments are re-told with stunning watercolours from acclaimed illustrator Diana Mayo. Read them together with your toddler and enjoy lots of fun activities encouraging even the youngest child to join in with the stories. It is a first Bible to cherish and revisit again and again. 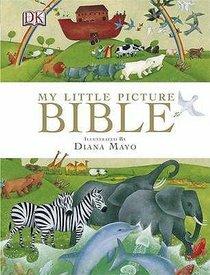 About "My Little Picture Bible"